Up to a point, banks and markets both foster economic growth. Beyond that limit, expanded bank lending or market-based financing no longer adds to real growth. But when it comes to moderating business cycle fluctuations, banks and markets differ considerably in their effects. In normal downturns, healthy banks help to cushion the shock but, when recessions have coincided with financial crises, we find that the impact on GDP has been three times as severe for bank-oriented economies as it has for market-oriented ones. Banks and markets channel savings into investment in quite different ways. Banks perform intermediation mostly on their balance sheets. They take in savings typically as deposits and provide funding primarily in the form of loans, often through close relationships with borrowers. Markets, by contrast, keep savers and investors at arm's length, by serving as a forum where debt and equity securities are issued and traded. Banks can overcome problems arising from asymmetric information and contract enforcement using the knowledge they accumulate through relationships; markets do so by means of contract covenants and the courts. All financial systems combine bank-based and market-based intermediation. But financial structure - the particular blend of the two intermediation channels - varies across countries. In this article, we discuss some of the determinants of financial structure, and how that structure might affect economic growth. The latter question is much debated. Some studies find that both financial intermediaries and markets are important for economic growth (Boyd and Smith (1998), Levine and Zervos (1998)). Others conclude that financial structure per se does not matter: it is the overall provision of financial services (banks and financial markets taken together) that is important for growth (Demirgüç-Kunt and Levine (1996), Levine (2002)). Another possibility is that the relationship is more complex and that the answer varies depending on a country's level of economic and financial development (Demirgüç-Kunt et al (2011)). We focus on three issues. The first relates to the relationship between a country's characteristics and its financial structure. We find that financial structure evolves alongside the changing profile of the economy. The second is the link between financial structure and economic growth. 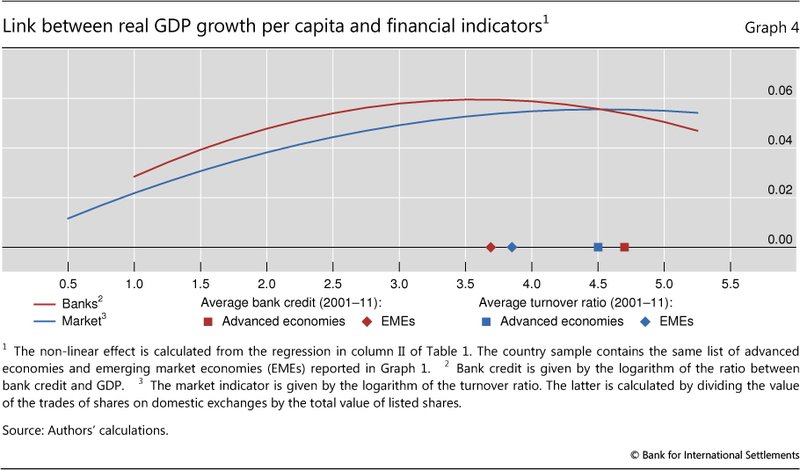 We find that banks and markets foster economic growth in a complementary way, but also that there comes a point of negative returns: beyond it, additional banking intermediation or larger markets go hand in hand with lower growth. The third issue relates to the role banks and markets play in moderating business cycle fluctuations. We find that the shock-absorbing function of bank-oriented systems is inhibited when the downturn coincides with a financial crisis. The rest of the article consists of four sections. The first presents the facts and discusses the mix between bank- and market-based intermediation across a range of countries. The second explores the varying linkage between financial structure and economic growth. The third empirically tests the roles banks and markets play in moderating business cycle fluctuations. The concluding section summarises the main results. Graph 1 shows the financial structure of 41 countries over two periods: the 1990s and the 2000s. It plots the ratio of bank credit to the sum of bank credit plus total equity and bond market capitalisation as a proxy for the relative importance of banks and markets. The higher this ratio, the more a given financial system relies on banks and, consequently, the less it does on markets. Two broad patterns stand out. First, financial structure differs considerably between countries. The relative importance of banking ranges from less than 20% in the United States to over 60% in Austria, Hungary and New Zealand. Second, financial structure is not static. Market-based intermediation has gained ground over the past two decades. To see this, note that roughly three quarters of the blue diamonds, which represent the ratio for the 1990s, lie above the bars, which represent the ratio for the 2000s. A closer look shows that the bulk of this shift reflects changes in emerging market economies. What drives cross-country variability in financial structure? What is the influence of real sector characteristics, such as the level of economic development or the sectoral composition of economic activity? And what is the role of institutional factors such as the legal framework? We discuss these issues by drawing on the literature and on cross-country sectoral information. Generally, market-based financial intermediation tends to increase as per capita GDP rises.3 Several economic factors may explain this. One is that the financial literacy of households and firms improves with economic development, lifting demand for services linked to market-traded securities (Allen and Gale (2000), Boyd and Smith (1998)). For instance, insurance companies, pension funds and mutual funds account for a larger share of GDP in richer countries. Another factor may be that more highly developed countries have stronger institutions. In particular, market-based finance benefits from better enforcement of property rights through a stronger legal and judicial framework (see discussion below). But differences in financial structure also reflect the sectoral composition of output. 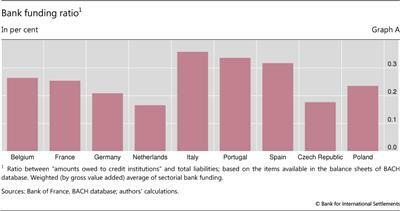 Some productive sectors are more likely to rely on bank loans as a source of external funds. By their nature, different lines of business are more suited to different types of intermediation. Sectors with tangible and transferable capital (such as agriculture), as well as those where output is easier to pledge as collateral (such as construction), are more amenable to bank debt finance. By contrast, sectors that rely heavily on human capital (eg professional services), or those where output is hard to collateralise, will tend to rely more on equity or bonds. Empirical analysis based on a cross section of EU countries confirms this overall pattern (see box for details). Firm size also has a bearing on the funding mix. Small firms typically depend on bank finance because of the fixed costs involved in tapping capital markets, not least those associated with the corresponding governance mechanisms. 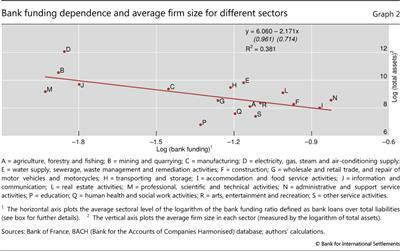 Graph 2 shows the negative correlation between bank dependence and firm size at the sectoral level. In particular, the graph plots on the horizontal axis an index of the economy's dependence on bank funding (the logarithm of bank loans over total firm liabilities) and on the vertical axis the average size of firms (measured by the logarithm of the total assets of the average firm in each sector). 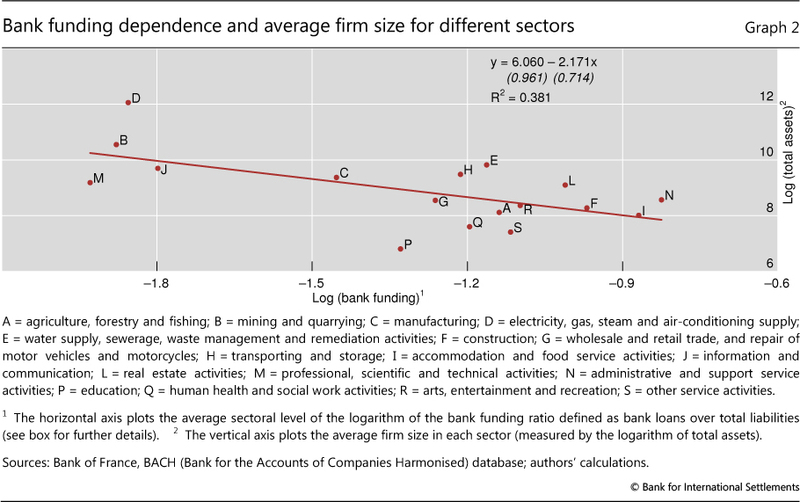 The downward slope means that sectors dominated by smaller firms are more bank-dependent. Turning to countries' institutional characteristics, as noted, financial contracts depend critically on the legal framework and the enforcement of contracts and property rights. Investors are more likely to part with their money if they feel sure of being able to claim it back. Research on the interactions between law and finance has highlighted a number of regularities.4 First, legal frameworks originating in the common law tradition tend to offer higher protection to holders of equity and debt securities. Minority shareholders have more tools, such as the exercise of their voting rights, to protect their interests from actions by management or large shareholders. For their part, creditors find it easier to avoid an automatic stay on assets and enjoy greater priority when their claims are secured and they face managements that have less freedom to seek court protection. As a result, common law systems foster the development of market-based finance, which depends on the efficiency of arm's length relationships between issuers of securities and investors. By contrast, banks, through their repeated interaction with clients and through their closer screening and monitoring of borrowers, can compensate for the more limited protection offered by French civil law frameworks. Legal systems in German and Scandinavian law tradition fall between common law and French civil law traditions in terms of the protection they offer to arm's length investors (La Porta et al (1998)). Empirically, there is a strong association between the origin of a country's legal framework and the composition of its business financing. Firms in common law countries tend to rely more on traded equity and have a more diffuse shareholder base than firms in countries that follow the French civil law tradition (magenta and blue bars in Graph 3). In addition, there is a correlation between the origin of the legal system in the country and the financial system's overall degree of development. 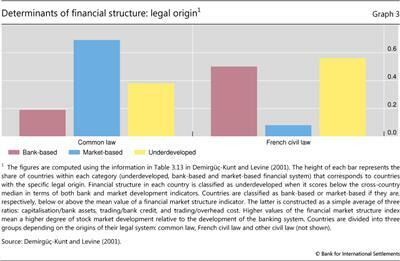 As shown by the yellow bars in Graph 3, common law countries tend to have more developed financial systems than countries with legal systems based on French civil law. What is the relationship between financial structure and economic growth? The literature suggests that both bank- and market-based intermediation are positively linked with output growth. But Demirgüç-Kunt et al (2011) make the more nuanced observation that, as economies grow, economic output tends to become less sensitive to changes in bank development but more so to changes in financial market development. 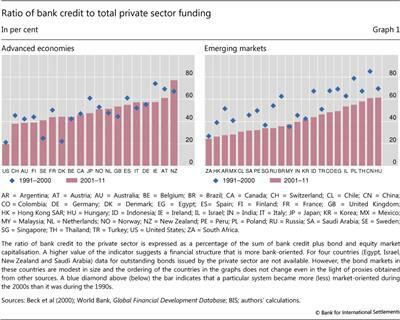 This suggests that the services provided by financial markets become comparatively more important as countries grow. In a similar vein, Cecchetti and Kharroubi (2012) examine how the size of the financial system affects productivity growth. They conclude that, at low levels, a larger financial system goes hand in hand with higher productivity growth. But there comes a point where larger financial activity is associated with lower growth. Law and Singh (2014) find a similar effect in the relationship between GDP growth and the size of the financial sector. Is there a link between the sectoral composition of an economy and its financial structure? where j=1, -17 indicates the sector and k=1,-,9 stands for the country. Both the numerator and denominator are averages over the period 2000-11, weighing yearly figures by sectoral gross value added. Unfortunately, it is not possible to disentangle control stakes from other equity financing raised on the market. As a result, the denominator includes total equity, together with bonds and bank loans, but excludes trade credit and provisions. 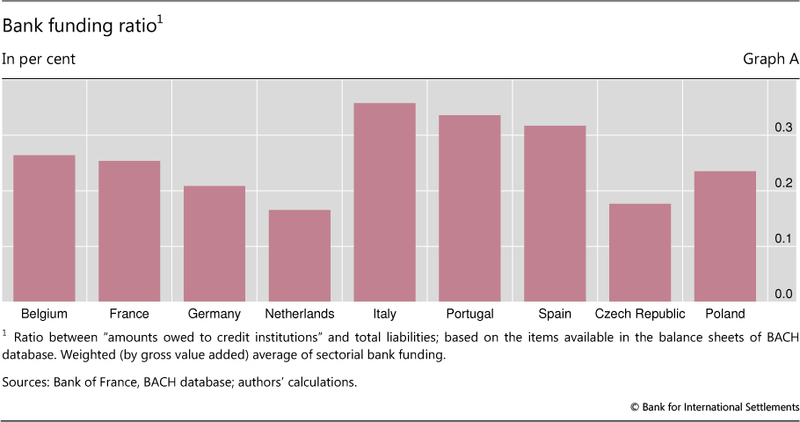 Graph A shows the average bank funding ratio for three different groups of countries: (i) core euro area countries (BE, FR, GE, NL); (ii) peripheral euro area countries (IT, PT, SP); and (iii) eastern European countries (CZ, PL). where j = sector, k = country, θj is a set of sectoral dummies (sector A = agriculture; forestry and fishing are excluded) and ρk is a set of country dummies (Poland is the omitted country). Table A reports the regression results. The simple model explains more than half the overall sample variability in the bank funding index (R-squared of 55% shown in the last row of the table, column I). Moreover, sectoral dummies explain a larger share of overall variability (R-squared equal to 41%, column III) than the country dummies do (R-squared equal to 14%, column II). Finally, once differences in sectoral composition are taken into account, there are no significant differences in the results across groups of countries within the sample. 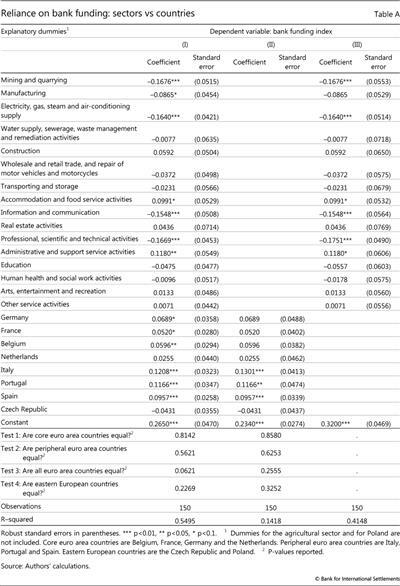 Statistical tests reject the hypothesis that the coefficients are different for core and peripheral countries in Europe or across euro area countries (p-values greater than 5%). The coefficients on the sectoral dummies provide additional interesting results. Innovative sectors, such as "Professional, scientific and technical activities" (sector M) and "Information and communication" (sector J), rely less on bank funding, while sectors where firms are typically smaller, such as "Accommodation and food service activities" (sector I) and "Administrative and support service activities" (sector N), rely on it more. We revisit these issues using a panel of 41 advanced and emerging market economies during the period 1989-2011. We augment the statistical model of Beck and Levine (2004), which estimates the effect of stock market and banking sector development on economic growth, by allowing for this impact to change with the level of financial deepening. The results reported in the first column of Table 1 show that only the development of the equity market has both a statistically significant and positive association with economic growth. 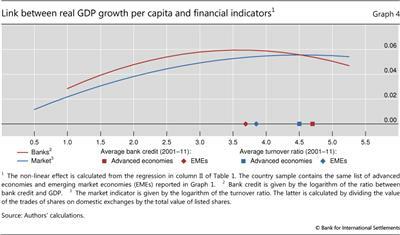 In contrast to other findings in the literature, a higher ratio of bank credit to GDP does not go hand in hand with higher economic growth. This difference might reflect the fact that these findings are based on earlier data samples or on a somewhat different set of countries that includes a lower proportion of advanced economies. The results of the non-linear specification in the second column of Table 1 indicate that increases in both bank and market activity are associated with higher growth, but only up to a certain point. Both indicators are statistically significant, suggesting that banks and financial markets provide different services and are complementary. The limits of financial deepening on growth are more clearly depicted in Graph 4. The horizontal axis indicates both (the logarithm of) the credit/GDP and the turnover variable, while the vertical axis measures per capita GDP growth. Growth benefits from a higher ratio of bank credit to GDP until the logarithm of the ratio reaches 3.7, or a credit/GDP ratio of around 40%. The corresponding peak for the logarithm of turnover ratio is 4.5, equivalent to a ratio of around 95%. These results are in line with the findings of Rousseau and Wachtel (2008): the finance-growth relationship so firmly entrenched in the literature is less strong in more recent data. Using information for the period 1960-2004, they find that excessive financial deepening or rapid growth of credit may have led to both inflation and weaker banking systems, which in turn gave rise to growth-inhibiting financial crises. The positive effect of financial deepening on growth is stronger for low-income than for high-income countries. The third and fourth columns of Table 1 split the sample on the basis of whether a country's per capita GDP is above or below the median for the sample. While the results for the lower-income countries are similar to those for the entire sample, only the coefficient on market turnover turns out to be statistically significant for the group of richer countries, and even then its significance is weakened. 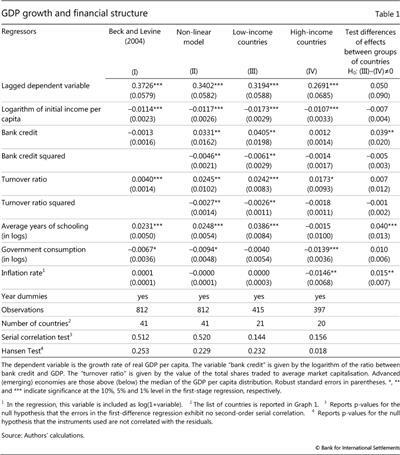 Similarly, the tests for the statistical significance of the coefficients between the two country groups (last column) indicate that there is a significant difference in the two sets of estimated coefficients relating to the contribution of banks to growth. These results confirm and corroborate the finding that banks provide intermediation services that differ from those provided by financial markets and which are particularly beneficial for countries at an earlier stage of development (Allen and Gale (2000), Demirgüç-Kunt et al (2011)). 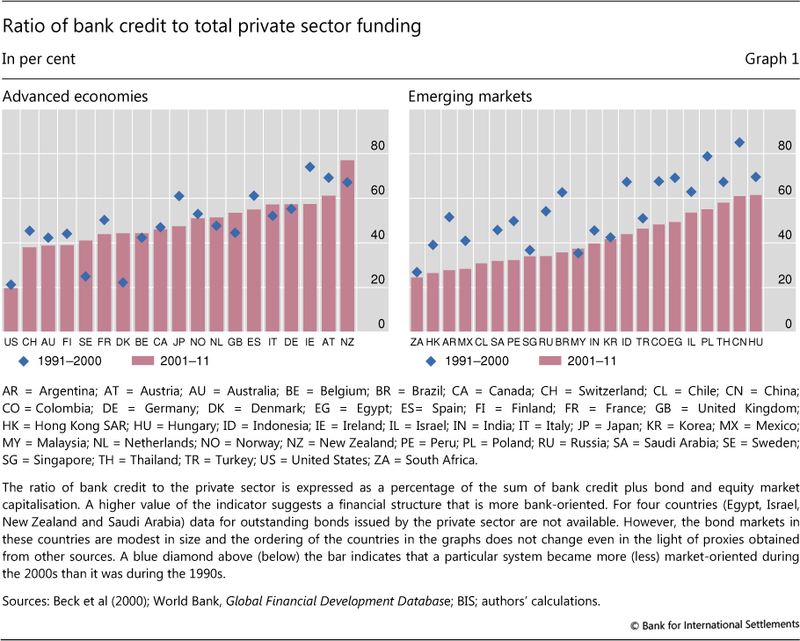 Banks are particularly useful to lower-income countries because they provide inexpensive risk management for standardised risks and can compensate for weaker institutions. As countries evolve and their financial needs become more elaborate, markets are better able to provide products tailored to specific users. Thus, as economies mature, increasing the demand for a broader set of risk management and capital-raising tools, they can benefit from a legal and regulatory environment that supports market-based activities. Banks and markets also behave differently when it comes to moderating business cycle fluctuations. In "normal" downturns, relationship banks, especially well capitalised ones, find it easier to keep lending than markets do (Bolton et al (2013)). Drawing on their long-term relationships with clients, banks are more inclined to offer credit during a downturn. By contrast, transaction lenders, who do not invest in information about the borrower, typically pull back during a recession. However, a financial crisis can impair banks' shock-absorbing capacity. When banks are under strain, they are less able to help their clients through difficult times. In addition, during a financial crisis, banks may put off necessary balance sheet restructuring (Caballero et al (2008)): instead, they may opt to roll over credit in an effort to postpone loss recognition (so-called zombie lending). This is something that capital market investors cannot afford to do. In a financial crisis, therefore, systems that are more market-oriented may speed up the necessary deleveraging, thereby paving the way for a sustainable recovery (Bech et al (2012)). The differing responses of banks and markets can affect the severity of recessions. 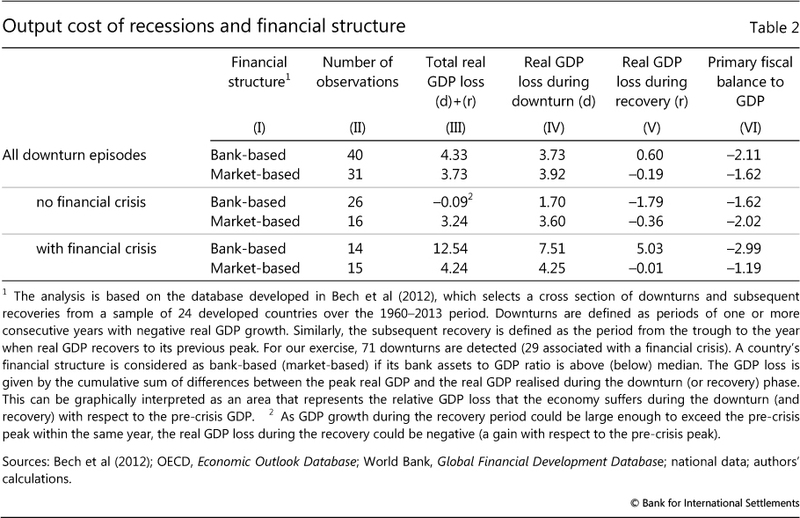 The average cost of recessions, in terms of forgone output, is similar between groups of countries with different financial systems (bank-oriented vs market-oriented). Table 2 shows average statistics for the output cost of recessions across different developed countries. 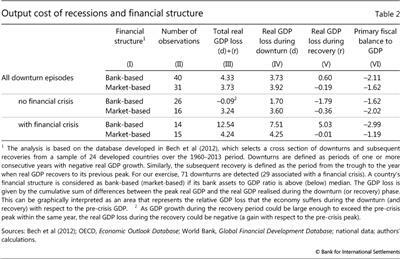 The top two rows of column III show that about 4% of GDP is lost during a typical recession. Most of this loss is incurred during the period from the beginning of the recession to its trough (column IV). When comparing the top two rows of the table, note that there is no material difference between the average experience of countries with bank-oriented financial structures and that of more market-oriented countries. When there is no financial crisis, economies with bank-based systems appear more resilient. 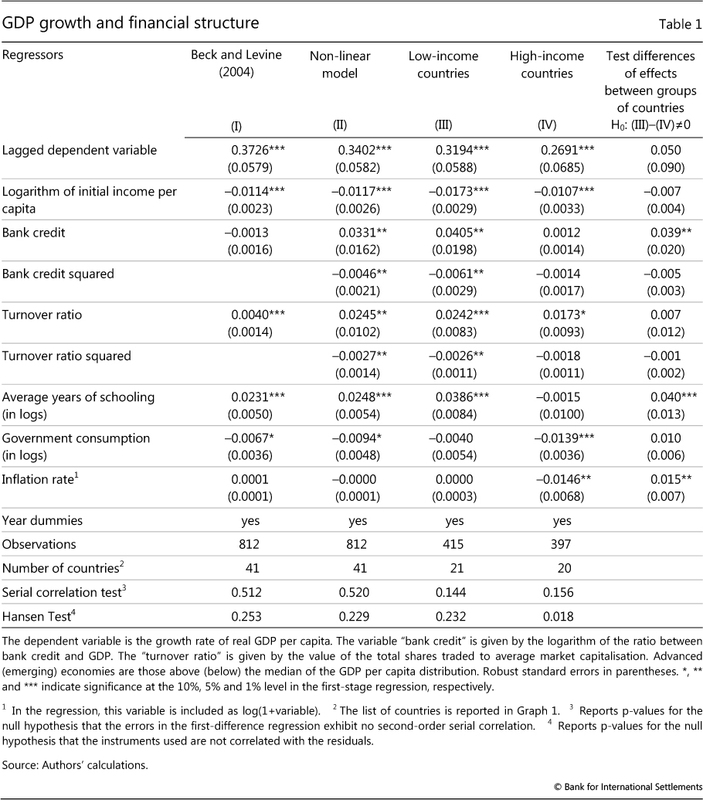 This is highlighted in the middle two rows of Table 2, which suggest that bank-based systems registered virtually no GDP loss on average. By contrast, in these same episodes, countries with market-based systems experienced an average output loss of more than 3%. A simple explanation is that, when banks are not themselves under strain, they help their clients absorb economic shocks. Finally, our evidence suggests that banks and markets differ considerably in their moderating effects on business cycle fluctuations. Banks are more likely to supply loans during a "normal" downturn, thus smoothing the impact of the recession. But their shock-absorbing capacity is impaired when the downturn is associated with a financial crisis. In this case, recessions in countries with bank-oriented systems are three times more severe than in those with a market-oriented financial structure. Allen, F and D Gale (2000): Comparing financial systems, Cambridge, MIT Press. Bancel, F and U Mittoo (2004): "Cross-country determinants of capital structure choice: a survey of European firms", Financial Management, vol 33, no 4, pp 103-32. Bech, M, L Gambacorta and E Kharroubi (2012): "Monetary policy in a downturn: are financial crises special? ", BIS Working Papers, no 388. Beck, T, A Demirgüç-Kunt and R Levine (2000): "A new database on financial development and structure", World Bank Economic Review, no 14, pp 597-605. Beck, T and R Levine (2004): "Stock markets, banks, and growth: Panel evidence", Journal of Banking and Finance, vol 28, no 3, pp 423-42. Blundell, R and S Bond (1998): "Initial conditions and moment restrictions in dynamic panel data models", Journal of Econometrics, vol 87, no 2, pp 115-43. Bolton, P, X Freixas, L Gambacorta and P Mistrulli (2013): "Relationship and transaction lending over the business cycle", BIS Working Papers, no 417. Boyd, J and B Smith (1998): "The evolution of debt and equity markets in economic development", Economic Theory, vol 12, pp 519-60. Caballero, R, T Hoshi and A Kashyap (2008): "Zombie lending and depressed restructuring in Japan", American Economic Review, vol 98, pp 1943-77. Cecchetti, S and E Kharroubi (2012): "Reassessing the impact of finance on growth", BIS Working Papers, no 381. Crouzet, N (2014): "Corporate debt structure and the macroeconomy", paper presented at the Annual Meeting of the American Economic Association, Philadelphia, 3-5 January. De Jong, A, R Kabir and T Nguyen (2008): "Capital structure around the world: the roles of firm- and country-specific determinants", Journal of Banking and Finance, vol 32, no 9, pp 1954-69. Demirgüç-Kunt, A, E Feyen and R Levine (2011): "The evolving importance of banks and securities markets", World Bank, Policy Research Working Paper, no 5805. Demirgüç-Kunt, A and R Levine (1996): "Stock market development and financial intermediaries: stylized facts", World Bank Economic Review, no 10, pp 291-322. ______ (2001): Financial structures and economic growth: a cross-country comparison of banks, markets and development, Cambridge, MIT Press. Fan, J, S Titman and G Twite (2010): "An international comparison of capital structure and debt maturity choices", NBER Working Papers, no 16445. Giannetti, M (2003): "Do better institutions mitigate agency problems? Evidence from corporate finance choices", Journal of Financial and Quantitative Analysis, vol 38, no 1, pp 185-212. La Porta, R, F López-de-Silanes and A Shleifer (1998): "Law and finance", Journal of Political Economy, vol 106, no 6, pp 1113-55. Law, SH and N Singh (2014): "Does too much finance harm economic growth? ", Journal of Banking and Finance, vol 41, pp 36-44. Levine, R (2002): "Bank-based or market-based financial systems: which is better? ", Journal of Financial Intermediation, no 11, pp 398-428. ______ (2004): "Finance and growth: theory and evidence", in P Aghion and S Durlauf (eds), Handbook of Economic Growth, Elsevier, vol 1, pp 865-934. Levine, R and S Zervos (1998): "Stock markets, banks and economic growth", American Economic Review, vol 88, pp 537-58. Peia, O and K Roszbach (2014): "Finance and growth: time series on causality", paper presented at the Annual Meeting of the American Economic Association, Philadelphia, 3-5 January. Rousseau, P and P Wachtel (2008): "What is happening to the impact of financial deepening on economic growth? ", mimeo. 1 The authors would like to thank Claudio Borio, Stephen Cecchetti, Dietrich Domanski, Enisse Kharroubi and Christian Upper for useful comments and suggestions. Magdalena Erdem and Anamaria Illes provided excellent research assistance. The views expressed are those of the authors and do not necessarily reflect those of the BIS. 2 More information is available at http://data.worldbank.org. 3 See Levine and Zervos (1998) and Demirgüç-Kunt and Levine (2001). 4 See La Porta et al (1998), Giannetti (2003), Bancel and Mittoo (2004), De Jong et al (2008) and Fan et al (2010). 5 Using the stock market turnover ratio as a measure of financial market development has some advantages compared with alternatives such as the ratio of market capitalisation to GDP. The turnover ratio is not affected by asset price valuations, as both the numerator and the denominator refer to the market value of stocks (Beck and Levine (2004)), and it is common in the literature, facilitating the comparison of our results with those of other studies. However, the turnover ratio has some potential shortcomings. First, as an equity market indicator, it is distorted by the trading of foreign securities in the country and the trading of domestic securities abroad. And second, it does not reflect bond market development. To address these shortcomings, we conducted a robustness check using, as a measure of market development, the sum of stock and bond market capitalisation as a share of GDP. This measure is available for fewer countries (37 instead of 41) and years (mainly for the last decade), which reduces the number of observations from 812 to 656. The results are qualitatively very similar (available upon request). 6 As in Beck and Levine (2004), we used the dynamic Generalised Method of Moments (GMM) panel methodology to obtain consistent and unbiased estimates of the relationship between the financial structure and economic growth. The methodology reduces the endogeneity bias that may affect parameter estimates and accounts for unobservable factors affecting individual countries by relying on instrumental variables. Blundell and Bond (1998) argue that first differences of exogenous variables can be instrumented by themselves, while first differences of endogenous variables are instrumented by the lagged values of the variable in levels. The countries included in the regression are listed in Graph 1. 7 The results are consistent with the general finding of Cecchetti and Kharroubi (2012). They also relate to the findings in Peia and Roszbach (2014), who study the cointegration and causality between finance and growth for 26 countries. In particular, they show that causality patterns depend on whether countries' financial development stems from the stock market or the banking sector. Their main result is that stock market development tends to cause growth, while a reverse or bidirectional causality is present between banking sector development and output growth. 8 Using a theoretical model where firms chose both the scale and composition of their borrowing, Crouzet (2014) finds that, over the business cycle, asymmetric shocks to banks' lending costs prompt substitution from bank loans to market debt, as in the United States during the 2007-09 recession. Additionally, these shocks have larger effects if the economy is initially more bank-dependent. For example, the recession they generate is 15-30% deeper in a version of the model calibrated to Europe than in one calibrated to the United States.